The Ontario Philharmonic led by Marco Parisotto is developing into a must-hear orchestra. Maestro Parisotto has shaped his players into a fine music-making instrument, fully capable of supporting the outstanding soloists they invite. Last year this time, in Koerner Hall, the Ontario Phil spread a gorgeous tapestry behind Shlomo Mintz for Tchaikovsky’s Violin Concerto. 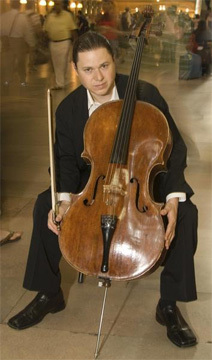 This year, it was cellist Matt Haimovitz they accompanied in Ernest Block’s unique ‘Hebraic Rhapsody’ Schelomo. Haimovitz is a one-of-a-kind musician. His teacher at Julliard, Leonard Rose described Haimovitz as “probably the greatest talent I have ever taught.” Once he had established himself in the front ranks of world-class cellists, Haimovitz took his talent into unusual venues. He played the complete Bach Cello Suites in clubs like The Knitting factory in NYC and the Black Sheep Inn in Wakefield, Ontario. This year, Philip Glass rewrote his film soundtrack Naqoyqatsi:Life as War as his Concerto No. 2 for Haimovitz to record with the Cinncinati Symphony. The voice of Haimovitz’s cello is raw. Bloch gives the cello two cadenzas before the full orchestra enters, the first accompanied by horns and a melismatic hum of strings, the second, unaccompanied, starting in the gritty depths of the low register and climbing by stages, three octaves, punctuated, as if from exhaustion by a sequence of dramatic pauses, before collapsing back into the deeps. The emtion is raw, and Haimovitz brings it. However, when the full orchestra took up the cello’s themes, their sound seemed thin and scattered, an unusual thing in this acoustically gifted Hall. It was a case of the orchestra warming up to Bloch’s “Hebraic” harmonies. Succeeding sections featuring very appealing soli by three violins, the viola, and by various winds brought the orchestra back on track, and they delivered a full-blooded performance. I particularly appreciated Parisotto’s obvious participation in every detail of the performance and the angular discipline he brought to balance the raw sensuality of Bloch’s writing. Haimovitz enjoyed himself so much, he did what I have never seen another soloist do: he sat in with the cello section for the second half of the program: Mahler’s Symphony No. 1 in D major “Titan.” This is a huge personal favourite of mine, one I am happy to hear anytime it is done well. I loved opening bars that shimmer and whistle and warble an atmosphere at first mysterious, until the trumpets’ fanfare and the winds give the cuckoo voice, when it begins to sound like spring is coming in all its medieval vividness. I don’t know of another work that offers such an astoundingly fertile flow of melodies, textures, most of them dancing joyfully as if at festivals or weddings, but some, as in the finale, marching to cymbal-crash and doom of drum toward titanic battles whose turbulence is gradually undermined by surges of lyrical melodies that seem to unite with the titanic energy and culminate into a giant jubilation. The performance was a co-presentation of Mooredale Concerts and Ontario Philharmonic.